I arrive with the intention of photographing another monument when I see him, vigorously cleaning this one. He is totally involved in his work, whistling a bright little tune. I stop to chat. "How are you?" I ask. "Good son, good!" is the reply (I'm over sixty years old!). The monument he is working on is dedicated to the Corvette class of ship in the Australian Navy. "Are you cleaning it up for Coral Sea week?" I ask, thinking how clever I was to put together navy and monument to come up with an event that is just a couple of weeks away. "No!" he says, somewhat indignantly, "It's Anzac Day on Monday!" I give myself a mental slap on the forehead. Of course it is. I'm feeling a little embarrassed, so I stay silent. He turns to me with a smile. "And it's my birthday on Tuesday!" "Happy birthday" I manage, weakly. "Yes," he says, "After the 8 am service here on Monday, I'll march and then have a few beers. Then I can have another beer on Tuesday." There's a bright gleam in his eye. "I'll be eighty-six!" he proudly announces. "I've cleaned this little beauty every year since we put her up in '88." I look at the central plaque on the monument, the one he is cleaning as we speak. 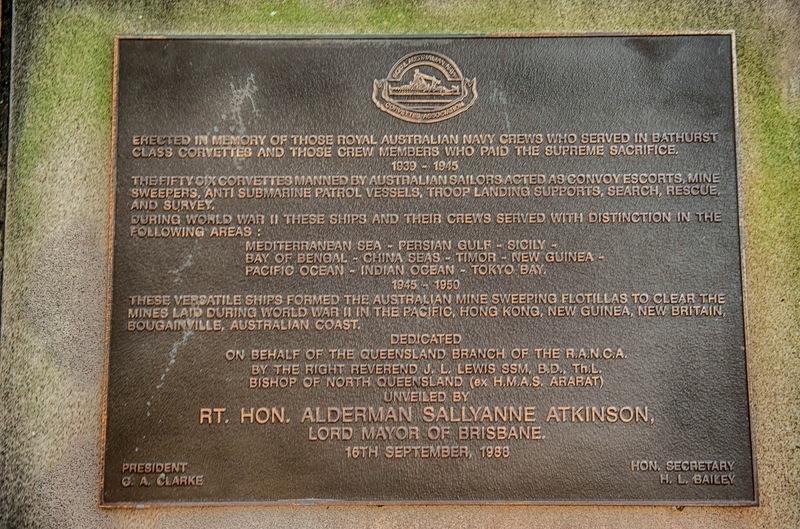 It was unveiled by Brisbane's Lord Mayor Sallyanne Atkinson in 1988. He's cleaned and polished this monument each year for almost a quarter-century. A sacred duty for Anzac Day. "I used to live at Newmarket, so it was no trouble, but now I live at Kallangur and it's a bit harder to get here." I do the mental arithmetic. Kallangur is about 35 km away - that's a 70 km round trip. "But I still do it," he continues. "I'm one of the younger ones, the others are a bit too old." I also check the time. It's 7 am, and it's only just full daylight. He must have left home in the dark to get here for his important chore. He has made good progress with the cleaning too, he's obviously no slacker. "These are all the Corvettes," he says, pointing at the plaque on the right hand side of the monument. 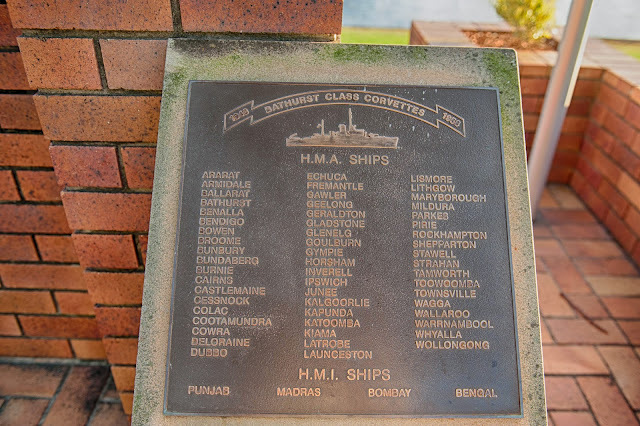 It contains three vertical lists, each list is an honour-roll of ships' names. "See the names?" he asks me. I look. "They're all Australian towns", I say. "Country towns, country towns!" comes the reply. I look again. He's right, of course - no capital cities here, they are all Australian provincial towns. "This one's mine," he says, pointing. I see the name Cootamundra four names from the bottom of the first list. It is positively gleaming from freshly-applied elbow grease. "It's the brightest one, " I say to him. "'Course it is," he says, "Why wouldn't it be!" Big smile. "And my mate served on this one - he's dead now," he says. He points again, but I don't know which name he means. It might be Ipswich, I'm not sure. It's not important - they're all his mates really. "Well, have a good day Monday" I say, meaning the Anzac Day march. "Could be my last one!" he says, still polishing energetically as I walk away. What a pity it is raining, always seems to come at the wrong time.